The internet faces a choice: corporate monopoly or public control. In the heady days of the Arab Spring and Occupy Wall Street, many trumpeted the emancipatory potential of the internet. They spoke of networks and hive minds, crowdsourced revolution and livestreamed liberation. But the internet, like everything else, is subject to market discipline and vulnerable to privatization — and with each new victory for the American telecommunications oligopoly, that digital optimism fades further from view. Last week, Federal Communications Commission (FCC) chairman Ajit Pai announced that his agency will be repealing the hard-won net neutrality protections instituted in 2015 by the Obama administration. To understand what net neutrality is and why it matters for the Left, Jacobin’s Meagan Day spoke to Victor Pickard, associate professor of communication at the University Pennsylvania’s Annenberg School, whose research focuses on internet policy and the political economy of media. Let’s start with defining the term. What is net neutrality? It’s all of the above. Usually it gets treated as a magical technology that’s beyond the regulatory realm, or as a commodity and a product of the free market. But it can be framed as a vital communication infrastructure which is necessary for democracy, or a public service on which democracy depends, or even a public good since the internet is a major means through which information is obtained. All of these ways of thinking about the internet begin to suggest that it’s not something we should leave vulnerable to the brute forces of the market. At the very least we should shield the internet from market forces, if not remove it from the market entirely. Corporate libertarianism is an ideological project that has origins at a core moment in the 1940s. It sees corporations as having individual freedoms, like those in the First Amendment, which they can use to shield themselves from public interest oversight and regulation. It’s also often connected to this assumption that the government should never intervene in markets, and media markets in particular. 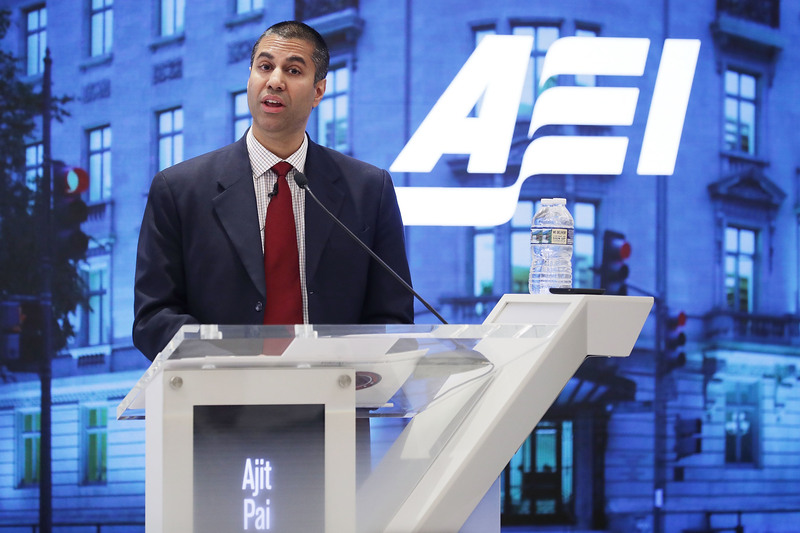 The FCC right now is exhibiting a textbook case of regulatory capture, which is the scenario where a government regulatory body begins to internalize the logic and value systems of the industries it purportedly regulates. Over time it begins to harmonize its actions with the commercial imperatives of the corporations it’s meant to oversee. We keep hearing about what Ajit Pai at the FCC is doing as a deregulatory project, but deregulation is a gross misnomer. It’s really re-regulation. It’s about restructuring our communications systems in line with corporate interests. What are the implications of that re-regulation for the media landscape? And more than that, we could start to see scenarios where ISPs don’t like the political views that are being disseminated from a particular news outlet. Without net neutrality they would be free to block or slow down content from those sites. There have been cases like this already. In 2005, the company Telus, which is the second largest telecommunications company in Canada, began blocking access to a server that hosted a website that supported a labor strike against Telus. Anyone involved in journalism or activism should be concerned about this kind of retaliation and censorship. Political ideologies opposed to corporate control are going to bear the brunt of this. There’s a growing anti-monopoly movement in the United States, and that’s clearly going to come into conflict with the political views of these monopolies. In the coming corporate libertarian internet landscape, the Left is disproportionately vulnerable. Roughly half of Americans live in communities that have access to only one ISP. So in many ways net neutrality is an effort to address a problem downstream from the core issue, which is monopoly power in the telecom industry. If we weren’t at the mercy of these monopolies, we could simply switch providers if they started violating net neutrality. This brings into focus the question of how we try to contain and confront monopolies, and there are three general ways of doing this. One is to break them up, and to prevent monopolies and oligopolies from happening in the first place by blocking mergers and acquisitions. Second, in cases where we concede that there are natural monopolies, if we’re not going to outright nationalize them then we want to heavily regulate them, and enforce some kind of social contract where they’re compelled to provide a public service in exchange for the right to operate. The third strategy, and in many ways the most important one, is to create public alternatives, like municipal wireless networks that can circumvent and compete with corporate monopolies. There’s a growing number of these publicly owned and governed internet infrastructures, and building more is crucial. How optimistic are you that a movement can emerge to fight for a democratic internet? The silver lining here is that so many Americans are concerned about something as wonky sounding as net neutrality. By last count over 20 million people signed petitions or wrote to the FCC about this issue. That’s mind-blowing. It shows a populace that realizes these decisions are made on the public’s behalf without the public’s consent. I take heart in that. One of the slogans you hear sometimes is that whatever your first political issue is, media reform should be your second issue — because you’re not going to get very far with your political interests if you don’t have a communication system that’s open to your views. Without net neutrality we’re facing a real likelihood of censorship, but I’m hopeful that we’re seeing an increasingly engaged public that wants to push back against the corporate agenda. Victor Pickard is an associate professor at the Annenberg School for Communication at the University of Pennsylvania and the author of America's Battle for Media Democracy .